Air pollution is not bad weather. It is not seasonal. It does not improve your immunity. It is not an unmodifiable fact of life that has to be put up with, because there is no choice. It is a public health crisis. It is a man-made problem, with man-made solutions. It is a yearlong problem. And it is a multi-source, pan-regional challenge. 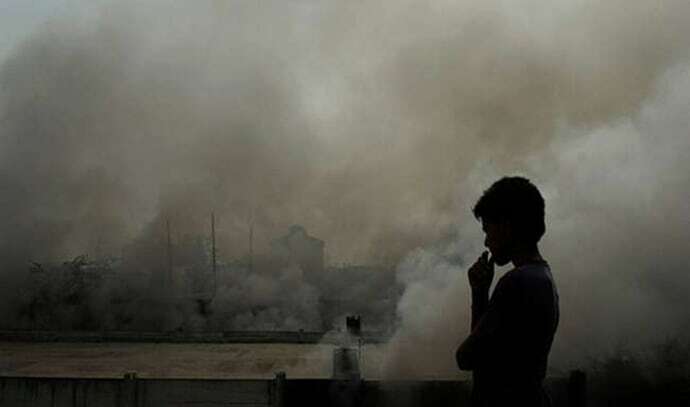 A report released earlier this year by the US-based Health Effects Institute (HEI) attributes 1.1 million deaths every year to toxic air in India. An earlier 2013 report by the same organisation put ambient air pollution ahead of other factors like alcohol use, high cholesterol and high blood sugar as a risk factor contributing to the national burden of disease in India. Outdoor air pollution is democratic. All of us, regardless of caste, class or community breathe it and we are all susceptible to it, although the young and the elderly are disproportionately vulnerable. Children are especially affected because their respiratory defences have not reached their full capability. They also breathe in more air per kilo of body weight than adults; so they take in more toxins per kilo of body weight as well. Seniors are often frail and with failing immunity. They are also likely to have pre-existing medical conditions that can exacerbate the effects of air pollution. Air pollution is not a simple "thing". It’s a confounding complex of particulates and gases. The abbreviation PM refers to particulate matter, which is designated as either 10 or 2.5. These numbers refer to the size of the particles. Dust particles from windblown soil and construction activity tend to be between 2.5 and 10 micrometers in diameter and are categorised as PM 10. To put this in context, a single strand of human hair is usually between 50 and 70 micrometers in diameter. Fine particulate matter that is less than 2.5 micrometers in diameter has been linked to up to 16,200 premature deaths (and a staggering six million asthma attacks) per year in Delhi alone. There are reports that one in every four children in the Indian capital suffers from a serious lung disorder. Other constituents of air pollution such as sulfur dioxide, ozone and nitrogen oxides are associated with a range of health effects from reduced lung capacity, to heart disease and even cancer. Toxic air results from a combination of vehicular, industrial and household sources. The burning of fuels like coal emits noxious gases like sulfur dioxide. Diesel engines spout huge amounts of nitrogen oxides. Construction dust contributes to coarse particulate matter. And all of these sources are responsible for PM 2.5. The burning of trash and leaves adds to the toxicity as does agricultural burning across the northern plains. An air shed is a region within which air circulates. The wind does not obey city boundaries, a fact that necessitates joint action across entire regions. Unless the north Indian states of Delhi, Haryana, Punjab, Uttar Pradesh and Rajasthan work in tandem to address all major sources of pollution - industrial, vehicular, agricultural and domestic - even herculean efforts by a single state or city will not prevent the entire north Indian airshed from choking. An especially important myth to bust is that pollution is only a winter phenomenon. Undoubtedly, dirty skies are more visible in the colder months. However, Delhi’s skies remain hazardously polluted all year. PM2.5 levels decrease in the hot months, but ozone levels, which are invisible, peak in the summer. Ground-level ozone is formed when Nitrogen Oxides and other volatile gases (VOCs or volatile organic compounds) are exposed to each other in sunlight. Warm temperatures are a catalyst for higher levels of ozone. Shortness of breath, tightness of the chest, wheezing, and nausea are common responses to ozone. It also triggers asthma and can aggravate other respiratory illnesses such as pneumonia and bronchitis. India records the highest number of ozone-related deaths in the world. According to the latest HEI report, ozone related deaths in India have vaulted by 148 per cent since 1990 (compared to 48 per cent for particulate matter). Finally, it’s worth spelling out that you do not become immune to air pollution by breathing polluted air. You develop respiratory disorders. Just as you do not become immune to malaria by getting bitten by infected female Anopheles mosquitoes. You get malaria. However, there is no need to be fatalistic about toxic air. India is a large, industrialising, populous, developing country and all countries in similar circumstances have undergone extensive episodes of polluted air. Air pollution has practical solutions at both the policy and individual level. Here are five actions that can be taken at an individual level ranging from purchasing pollution mitigation gear to making long-term behavioural changes. Without the latter, the former will be akin to a bandage on a broken arm. 1) Invest in a high-quality mask that can filter out the majority of particulate matter. The US National Institute for Occupational Safety and Health offers mask certification based on the amount of particulate matter filtered out. An N95 rating, for example, means a mask filters out 95 per cent of airborne particulates. But even cheap and simple surgical masks can help to some degree. The most important element is how a mask fits against the face. Air gaps that allow in particulate matter render the mask ineffective. 2) We might have grown up being encouraged to open our windows to let fresh air in. In fact when ambient pollution is high one of the best counter measures is to insulate the house, ensuring that dirty air is kept outside. Get a handheld device to measure pollution levels inside the home so you can take appropriate action if readings are unacceptable. 3) Get involved in your residential welfare committee to make sure that the neighbourhood’s trash is sorted and recycled rather than burned. Look into composting leaves and cut grass from gardens and parks rather than allowing them to be burned. 4) Limit car use. Think hard about the effects on your health every time you choose to use your car. Car pool. Walk. Bike. Use the Metro. 5) Make air pollution an election issue. If politicians come to believe that the environment can win them votes, policy changes will be more forthcoming. Clean air is as basic a right as roti, kapda aur makaan. We need an Anna Hazare of ambient air pollution emerging, around whom a genuine civil society movement can emerge.